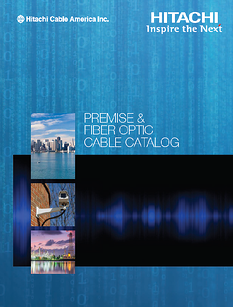 Hitachi Cable America (HCA) designs and manufactures high-performance copper and fiber optic communication cables. Our modern 300,000 square foot facility is located in Manchester, New Hampshire, USA. Our equipment and advanced engineering technology enable us to produce a wide range of products to meet all industry-standard and custom cable needs. HCA is a standards and technology based manufacturing company. Our cables are designed to exceed the most stringent ANSI, UL and CSA requirements. In addition, all of our premise and fiber optic cables comply with TIA and ISO telecommunications cabling standards. The Manchester facility is ISO 9001 registered and is a showcase example of a fully-automated cable manufacturing plant. The Manchester facility produces over 4500 different cables. 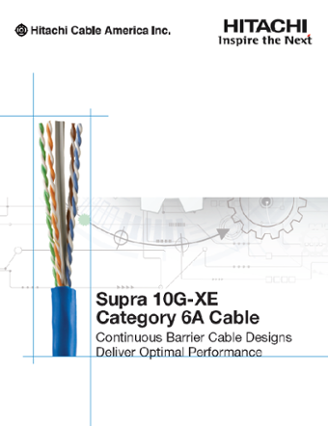 Products include our Supra 10G-XE™ Category 6A cables for 10 Gigabit Ethernet, our Power+™ Category 5e PoE cables capable of accommodating up to 140 watts of power, our Mudguard-EX™ cables used on oil drilling platforms, our NanoCore™ fiber optic cables that offer industry leading diameter to strand-count ratios. HCA also manufactures cables for the cell tower industry, aircraft industry and more. HCA has built its brand and its reputation by providing the very best cabling solutions in the industry. As an innovative cable manufacturer, HCA has come to learn that providing a solution means much more than just delivering the appropriate cable for the project. For Hitachi Cable, the real solution lies with providing more than what the customer expects. 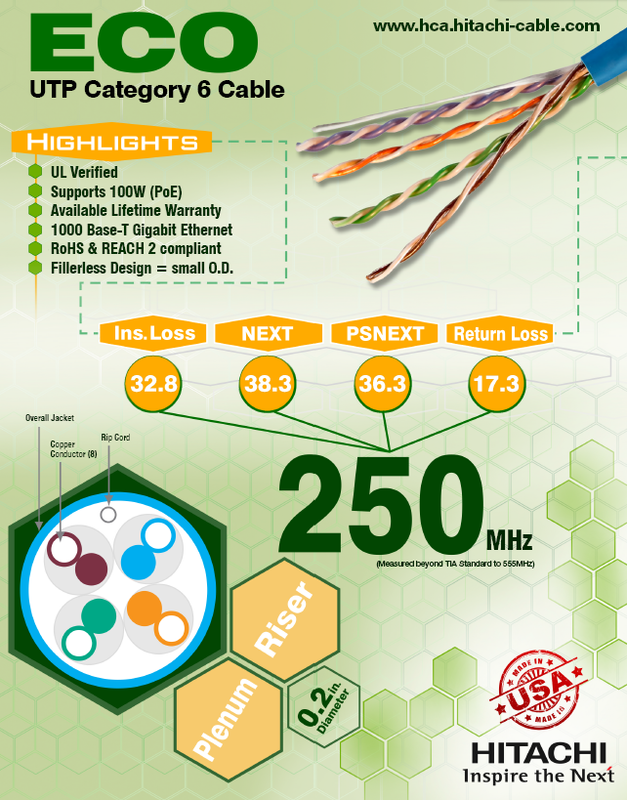 Cables build to a specific standard, such as ANSI/TIA-568-C.2, don’t just meet the standard, they exceed it. And, in most cases, the cable is 3rd party verified to that standard. Whether it's outstanding customer service, a better value, or a fast turnaround, we strive to be better than the competition. And, we are very proud of our Made in USA heritage. Throughout our Manchester, New Hampshire facility we incorporate both time-tested and cutting edge cable manufacturing technology to build our cables. We regularly invest in the latest equipment to ensure our product is the best and we welcome the opportunity to show it off. 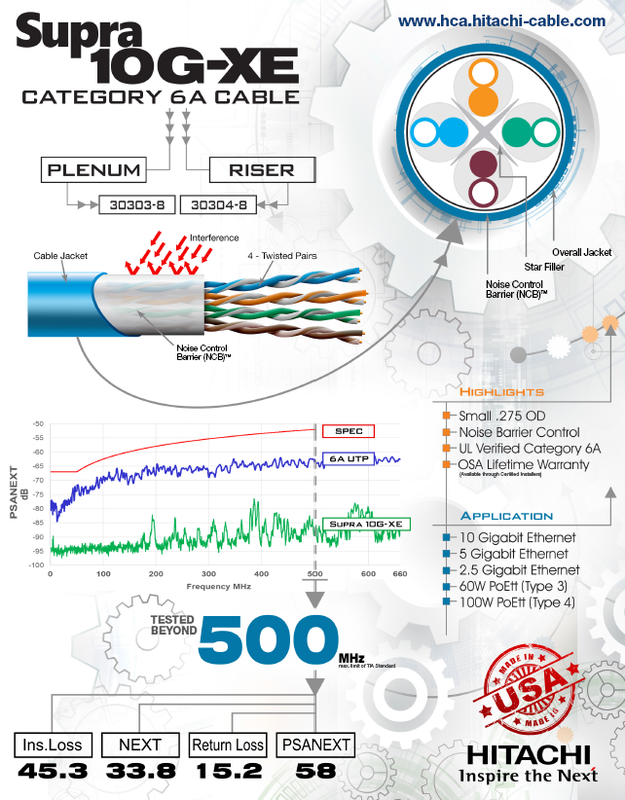 Hitachi Cable America (HCA) manufactures Catetgory 5e, 6, 6A, 7, 7A and now ever Category 8 cable. 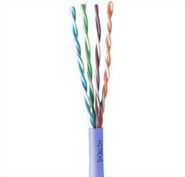 The wide range of products ensures we have a copper communication cable for almost every application. Many of these cables can be covered by HCA’s lifetime warranty when installed by a certified installer. Click here to learn more. HCA has a long history of designing carefully engineered fiber optic cable for best-in-class performance, ease of use and flexibility. Our facility features state-of-the-art machinery continuously monitoring and maintaining optimum line speeds while simultaneously protecting the glass fiber. From simplex fiber constructions to large, armored multi-fiber cables, Hitachi Cable America's wide range of standard solutions will accommodate your needs. 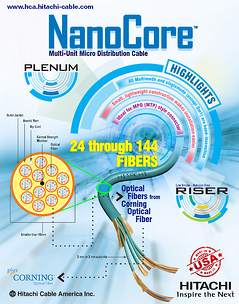 And, when it comes to small diameter cables, HCA has available its NanoCore™ family of micro distribution cables. 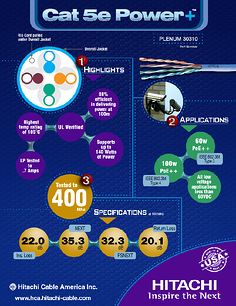 HCA offers an industry leading 9.9mm 144-strand fiber optic cable. Click here to learn more. The process for making great flat cable is simple. Start with the best materials used with the best tools. We run to the tightest tolerances in the industry with regards to span and width of our cables. 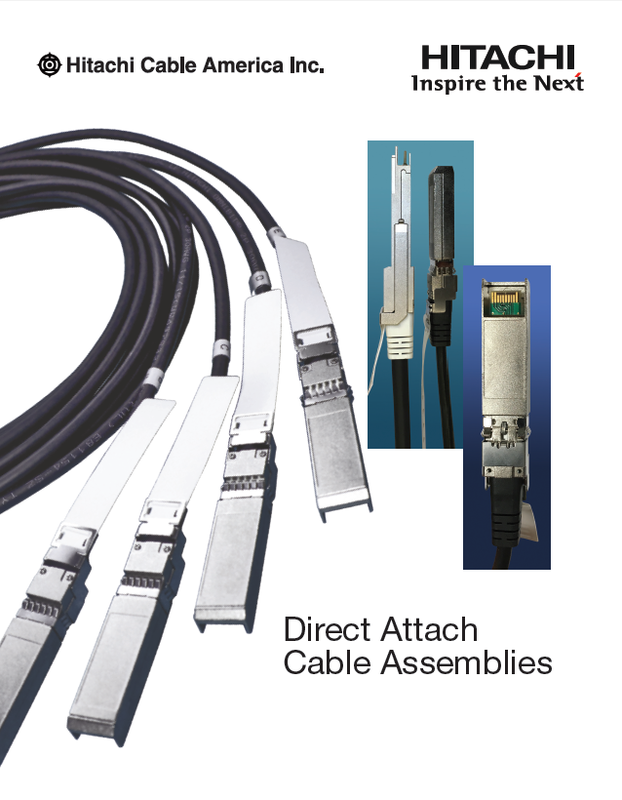 In flat cables, the key to low cost termination is ease of the termination during the IDC process with consideration to minimize scrap. Click here to learn more. Electronic cable constructions to meet the most demanding electronic applications like computers, audio/video, SCSI, networking, communications and other connectivity solutions. Custom designed electronic cables are manufactured to meet the strictest OEM tolerances. Click here to learn more. 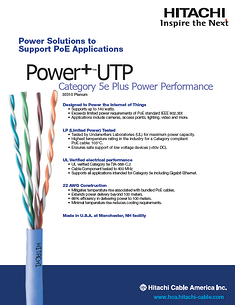 Hitachi Cable America has gone well beyond just standard Category cable when it comes to Ethernet applications. HCA now offers dozens of unique industrial Ethernet cables designed to work flawlessly in a specific environment or under extreme conditions. Options include solid or stranded conductors, shields and braids, low temp or high temp, 600 volt capability, high-flexibility, etc. And, at the same time, provide maximum data throughput. Click here to learn more. 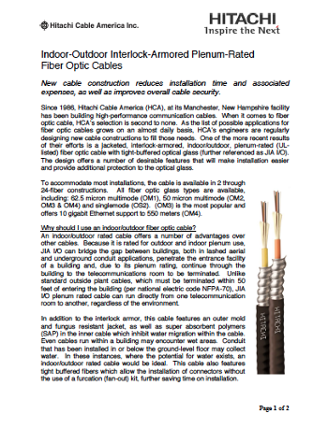 To learn about amored cable, download this pdf from Hitachi Cable America on Indoor-Outdoor Interlock-Armored Plenum-Rated Fiber Optic Cables.